John Swords asked if I would be up for making the journey from the UK to Texas for the SXSW event next year to be part of his panel Second Life Where are they now. I said yes straight away. Panels are democratically decided, so get voting please. Its an ideal panel for those of us who have made major changes in our lives, in my case starting an enterprise surge then moving from intrapreneur to entrepreneur because of it. I think the subject is right up our collective virtual streets, and specifically the fact this was no dead end but the start of something much bigger for everyone. The prize for innovation in avatar interopability goes to …. I was taking a look at the latest incarnation of off road console gaming. Codemasters Colin McRae Dirt 2 on the Xbox 360. The previous Dirt game was brilliant and it looks like this is going the right way too. The demo is even packaged with voice overs from Ken Block and Travis Pastrana indicating it is a demo (i.e. not just a disabled functions as with most demos). Having had a blast around an excellent simulation of a Baja track and then an even more impressive and stunning rally stage set in Morroco I was thinking about how this mirror world, and the purity of the experience as a simulation blended with fun and some interesting game related features (such as rewind when you total the car) would not be one to have any quirky avatar or non car related expressions of personality in it. I often use Forza 2 (soon Forza 3)(as here in 2007) as an example of how expression and customization of things like cars are done in context and that interoperability is a social and branding activity more so than a technical challenge to move data from one environment to another. “We don’t want our avatar from X, wandering around in Y as it will break the atmosphere”, “yes but we can”. I happened to pop into the demo customization options and selected something that said avatar as a cockpit customization. I was amazed, amused and impressed when on the replay of the hectic drive I saw this. 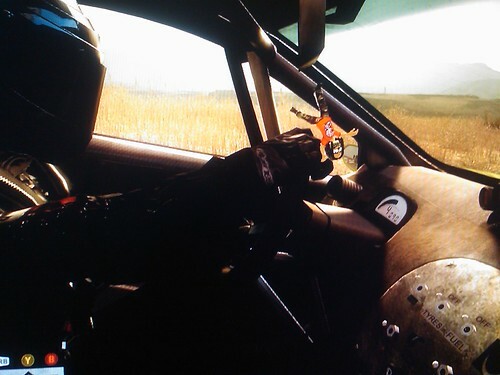 My personalized xbox avatar dangling from the mirror, swinging around with ragdoll physics in car. It s such a subtle little idea, yet I was surprised. There in this real yet fun off road driving simulation, where mentally I was the driver of the car in overalls and helmet, hurtling and sliding through the desert, I was able to reference back to a little bit of my more global system wide visual persona. 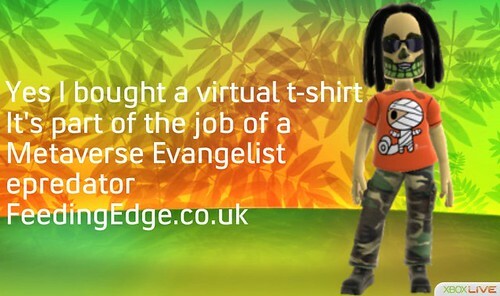 My predalike dreadlocked avatar with his new virtual t-shirt. It did not break the spell, it fitted. The avatar was embedded in world yet not interfering with it. Well done to the Codies ! Whilst this feature was on the 360 I am sure there are equally interesting features on all the other versions it is out mid September (which whilst i am on the subject all the games that get release pre-xmas are always in mid September which make it mighty annoying when the predlets want to by me a birthday present for the end of August! I was investigating some other avatar creation tech and dropped into Gizmoz. Increasingly there seems to be simple yet accurate ways to capture and model faces. In this case a single photo was enough to generate this image. Of course whether we choose to represent our real faces, versions of us adjusted, or some much more abstract rendition in various places online is both personal preference and context. Gizmoz seems like a lite version of Crazy Talk which incidently got a good few mentions on this weeks dogearnation podcast. web.alive it’s looking good to me. 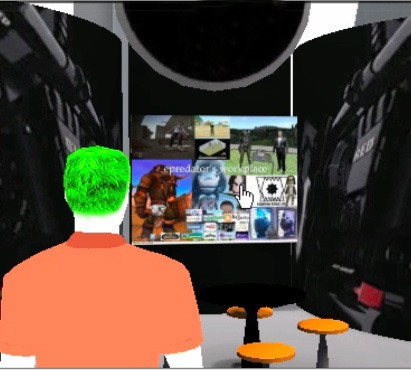 In exploring various virtual worlds it is always good when you are able to try some of your own content and interact with a space. My friends at Nortel let me use some space in web.alive to experience what the basic building blocks can be within the space. Many of you will have visited the eLounge the Lenovo Thinkpad customer facing environment, which is very effective indeed. Remember Web.Alive is a web browser plugin powered by unreal. I should add this little image was from me also experimenting with vmware and running NT on my MBP. The key for me was that whilst logged in to this web plugin I was simply able to right click upload my Washing Away Cave Paintings pitch and there it was. Of course this sort of interaction is something that is key to many enterprise virtual worlds. They key here though is the web plugin nature of the client. Some other interestingly useful features are things like sound/voice proof offices. A particular feature I like as it was the glass cube offices that you could see a meeting occur but not hear it that I thought were important in the very old icelandic SmartVR system that I got to evaluate back around 2000. The dynamics of location, seeing who was gathering but not being party to it is a an important part of many offices. It is a degree of organizational and political transparency, but still keeping the conversations as “secret” as they need to be. When you also see some of the things the guys have in the pipeline I think many of you will be very impressed as I was. That is there’s to unveil though. Also if you want to visit a public web.alive instance that is not elounge Mellanium have a build of a furnace. It is a demonstration of an engineering visualization. http://furnace.projectchainsaw.com A handy hint if you want to see you avatar (3rd person) hit v or scroll wheel out. I quite like seeing my avatar in these environments yet prefer first person in games and driving sims for some reason. I love this video, I have seen a few retweets on it. Whilst it is poking fun at online interactions, it is also supporting them and their diversity. Though I am not going to over analyze what is a great production piece of comedy. This week saw an update (a very quick to load one I should add) to the Xbox Live experience on the 360. As reported in virtual world news virtual goods are on the rise. One of the key elements is that the avatars now have more than the free set of clothes to pick from, but instead have a range of items from 80 mspoints to 320 mspoints to adorn your representative online. For those of you who have not seen the 360 dashboard your friedns and contacts are always visible in avatar form as an integral part of the experience. When you play certain new games like 1 vs 100 the avatar is your representative in that environment. It is very much a blend of mii and ps3 home, but it is intriguing. I thought I should try and buy a virtual item, though I kept it simple with this very cheap t-shirt. 50p or so I think it worked out as. As I have commented before these virtual items are the same principle as buying a mobile phone ringtone, except in this case you cant easily make them yourself. Apparently some games will now be dishing out avatar kit. The problem comes from whether you feel you need a constant churn of looks or if you are happy to be recognised in some way shape or form. As some of the things are props rather than clothes this helps that problem go away, buying a light saber, a football or a chicken with a pulley (yes there is one) all augment your current look without altering it too much. Maybe one day there will be a proper predator look with the games in the pipeline. Sign me up for one of those please! So a few million people spending a few pounds each. That seems a reasonable business model? A big thanks to Andy Piper for tweeting this. He was watching Bang Goes the Theory last night on BBC1, which is a prime time science investigation show. On it the one of the presenters, Dallas, went and had a full body scan and then showed a laser sintering 3d printer build the model of him from that scan. 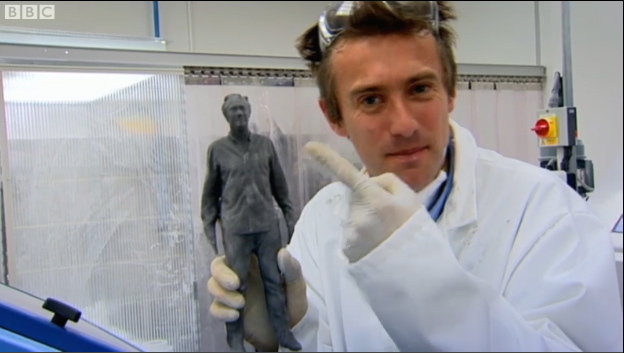 The show was not actually about 3d printing, it was a prop they built to investigate bio degrading plastic, by then destroying his mini me. The 12 inch figurine was rendered in a large machine, but of course there are many smaller printers and you dont always have to wear a white coat and glasses. The 3d body scan was part of the process, but as 3d Printers can build anything you don’t always have to go from such a complex to gather model. It will be interesting to see the viewing figures for this show, as now that means a whole host of people who had never heard of or seen 3d printing will have seen it was real, not science fiction. A bit of a shock 15 minutes after Eastenders I am sure. I also wonder in this sparked any future Fabricaneurs to realize the impact of this technology on the planet? This just turned up on my twitter stream (via @jefftippett) it was reported in Fast Company (well worth a look at that article) It is obviously amazing, the pictures and subtitles say everything really. Using technology of various sorts to provide inpuo to, and get output from a holographic display. Another glimpse of the future made real. There is some cool content for G.I. 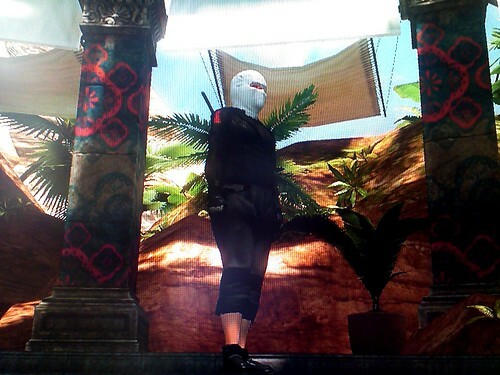 Joe the movie appearing on PS3 home. A set of clothing parts in the threads store. This is great as I can now cover my face, in protest at not being able to have green hair for some still inexplicable reason. It was great to see the G.I. Joe clothes spread through home in various combinations. Here I am a mix of white ninja, black ninja and wearing Star Trek original series trousers. An interesting combination. 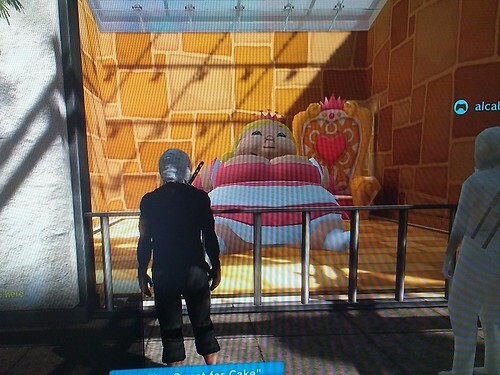 Whilst I was on I noticed a new promo space for a game called Fat Princess. It was a cartoon themed environment with lots of statues matching the game. Interestingly it had a little mini treasure hunt Xi style. In the environment (whilst still populated with other users) you are able to hunt cake hidden in little bird cages and answer eight questions on the game. This is not state of the art gaming, but I did feel the need to answer. It is also interesting as your view of the space is actually different to that of others. i.e. you wont see the cake unless you are personally on the quest, on completing the quest the princess changes into the larger version of the princess. This is a reward, but for the individual player. Everyone else will be seeing you as an avatar in world, but the princess will be the regular princess. This concept can be tricky for people lost in the concept of a unified world. There is no reason to not see a completely different representation of a world to every other user of that world. Of course there is then the question of what it is you are all there at the same time for in the first place. One other twist was that completing the quest, bothering to engage with the advert in effect, gives you a virtual object. In this case the royal throne to place in your own apartment. 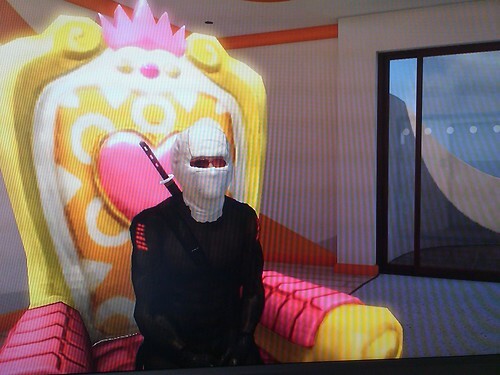 So here I am, in my lightly decorated apartment (without the ability to upload my own pictures and videos as I live in Europe and SCEE cant seem to get round UGC legal issues), wearing my G.I. Joe cool costume (that doubles as a protest for no green hair) sitting in my Fat Princess virtual throne that I won by walking around an immersive advert with lots of other people (mostly all wearing G.I. Joe clothes). Using nature as inspiration, and applying the science of engineering (physical and software) produces some very intriguing results. As a fan of both genetic programming and nature inspired code such as flocking so see it embodied in a physical device was fantastic. What is clear is that all the things the gadget show look into are very real and very now. Maybe there is space in the schedule for a future thinking gadget show? (We used to have tomorrows world). Start with the existing gadgets and then extrapolate forward a few years to show where it will end up. Happy to volunteer my services to any TV execs out there too. Also worth following @JasonBradbury on twitter BTW.